It is globally accepted that retail investors – whether in property or share market are market followers. That is, they get on board well into the cycle – up the risk curve – unwittingly. But it happens every cycle. This is a simple monthly line chart. One of my favourite big pictures. And probably the most important of all charts for investors. Of course when buying and selling I also look at the weekly and in particular the daily to fine tune my moves. 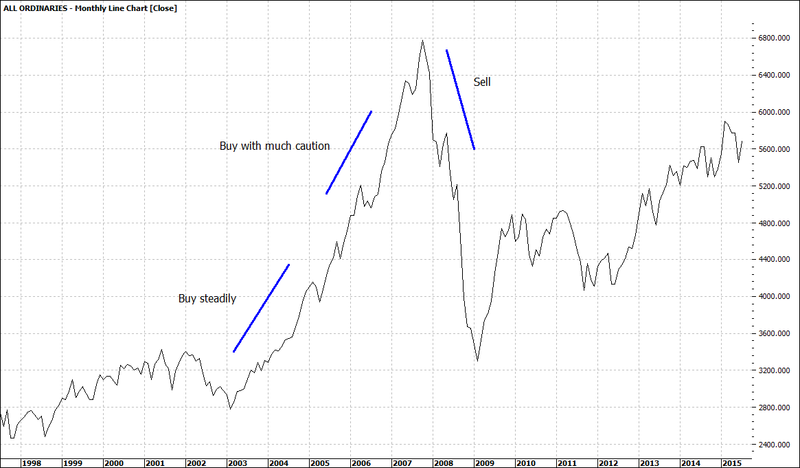 I bought heavily in March and April 2003 – but was also ready to throw my buys back in should they not meet expectations. But risk was not high as the market had taken a small hit after US started bombing Iraq. The market recovered very quickly after the first carnage happened and was up and up for the next almost five years. But as you can see you had a year and more to get on board. Lots of time. Many investors procrastinated and waited and waited and guess what finally jumped at the end of 2007 – way up the risk curve. Now some may say that this is obvious to see now in hindsight. It does not matter what market it is when you see such long moves up it is time to start bailing. I went to cash late December 2007/January 2008 and stayed largely in cash since. All of this, I admit, can look simplistic but I know it works. When I buy and sell it is very much a progressive process. I buy small lots and then add more during market pullbacks. It is a series of small but focussed steps and over time one builds substantial positions. Selling is a different matter. When I decide to go I sell down quickly before the exit doors are crammed. I don’t wait for the top of the market. In general I am happy to get most of the big trend. I don’t expect a share market crash in the coming weeks but I am ready to buy when it does come. I am happy to stay in cash and it does not worry about the miserly 2-3% I get on cash. Because I know that by stalking the market and being patient I will find another entry point where risk is relatively low and the upside big. The returns far outperform cash term deposits so I stay in on ‘’call cash’’. When buying in I don’t aim to find the bottom of the market but often do. When disaster happens I know there will be a few days of ‘’weeping and gnashing of teeth’’. Some sellers are slow to react thinking the next day might be a recovery. My experience tells me that there will generally be 3-4 days of heavy losses and usually followed by a day of capitulation – the day when the pain becomes too unbearable. I start my buying then. Not with gay abandon as no buy is a sure thing. I have my stop losses in place but generally feel at ease being the contrarian – buying as others sell. When that next crash comes I will be happy to share my thinking and entry points - and stocks. A big question is should one even sell in a crash or just turn off the news and tell yourself the market will recover. Not so simple as that and I will tell you why next week.